"Simple storage for our favorite products!" 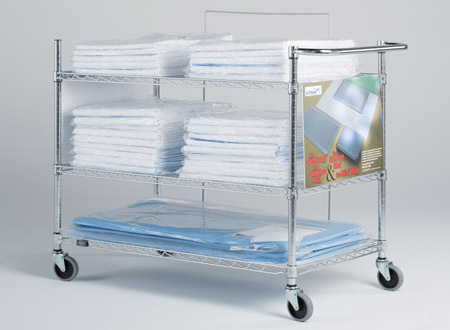 Flagship's Wheeled Storage Unit is a sturdy metal, 3-shelf cart that will hold 40 to 50 assorted disposable mats. 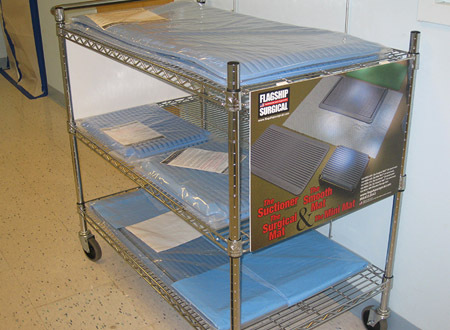 It provides a safe and economical way to store your surgical mat inventory, and its sturdy caster wheels make it easy to move around the OR. The Unit also has product catalog information pictured on it , which makes re-ordering products simple. It's a must-have for any facilities using Flagship products.